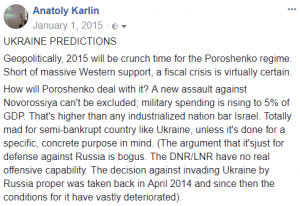 Geopolitically, 2015 will be crunch time for the Poroshenko regime. Short of massive Western support, a fiscal crisis is virtually certain. 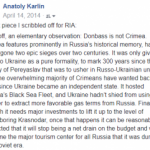 How will Poroshenko deal with it? A new assault against Novorossiya can’t be excluded; military spending is rising to 5% of GDP. That’s higher than any industrialized nation bar Israel. Totally mad for semi-bankrupt country like Ukraine, unless it’s done for a specific, concrete purpose in mind. 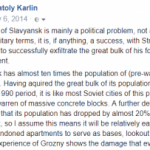 (The argument that it’sjust for defense against Russia is bogus. The DNR/LNR have no real offensive capability. 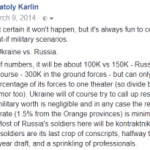 The decision against invading Ukraine by Russia proper was taken back in April 2014 and since then the conditions for it have vastly deteriorated). A new war can explain economic failure and provide a smokescreen for intensification of crackdown on pro-Russian dissent in Ukraine. Unfortunately, pensioners & laid off public workers are no match for neo-Nazi thugs when it comes to street brawls. The neo-Nazis are in control of the power ministries and they will remain well fed to the very end. The West will of course turn a blind eye to all this, feigning ignorance or insisting that they are marginal political forces. Scen 1: With the junta’s popularity at all time low due to economic collapse, pro-Russian forces come to power. This can either come via a second Maidan (though I don’t consider that likely, to be honest – see above), or via Poroshenko making a turnaround to ward off attacks from nationalist and/or populist forces, either on the streets or amongst his elites. Poroshenko is more of an apparatchik than an ideologue so this is a real possibility. Scen 2: Immiseration is ably countered with repression. Many dissenters and able-bodied Ukrainians leave for the EU or Russia, so you’ll have fewer opponents – both of the economic and ideological variety – on the streets. If the junta survives 2016, I am sorry to say but chances are it will then stabilize and begin to recover. That’s just the nature of things, sooner or later.